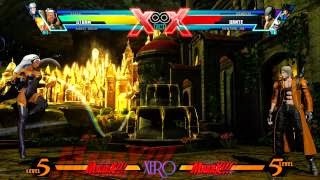 Xero18 has posted new Ultimate Marvel vs. Capcom 3 video content. This time Storm's corner Hailstorms are on display. One uploader who has stood in the Ultimate Marvel vs. Capcom 3 combo game for a decent amount of time is Xero18. The combo goer has posted another video, exploring Storm's corner double Hailstorm tech. The combos are not optimized as the point of the clip is to demonstrate the tech.